SCOTUS gay marriage hearing: One protester is queen for a day. 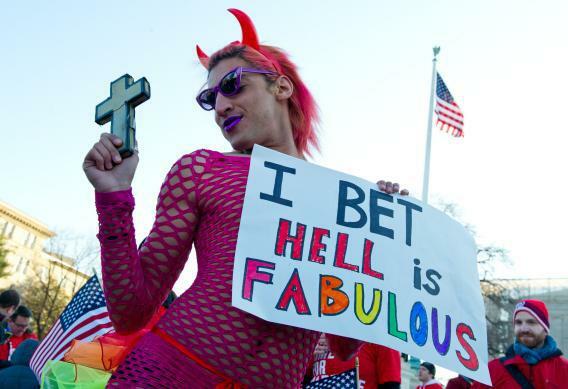 “Queen Amor,” a pro gay marriage activist, poses in front of the US Supreme Court March 26, 2013 in Washington, DC. The duelling rallies outside SCOTUS today congealed into one hours-long goat rodeo. I’ve only been showing up to these sorts of circuses for four or five years, but I’ve never seen one that took so many confusing turns, so fast, with such an attachment of police. As I’ll explain in too much detail once my story goes up, pro-equality protesters made life as hard as possible for the “March for Marriage” contigent making its way slowly past the court. Pastors and activists kept positioning themselves in front of the conservatives’ line, holding a banner or signs, effectively photobombing every image. It never got violent, but it got heated. At one point, one of the frustrated Latino pastors from New York (churches from that state and New Jersey sent 700 people to the march) broke from the MFM pack and started beseeching the pro-equality protesters for respect. “Free speech!” he said. “Free speech! I have free speech!” I taped him as he bolted to the front of the line, proudly waving his sign and shouting “JESUS!” up until a drag queen who went by Queen Amor invaded his space. There was a solid hour of this insanity, and a couple hours of lower-grade insanity.